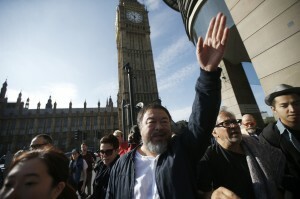 Ai Weiwei, a Chinese dissident artist and activist known for his critical view of the Chinese government, has a new cause. As a political activist, Ai has often used his art to comment on the Chinese government and human rights issues. After government-constructed schools collapsed during the 2008 Sichuan earthquake, killing more than 5,000 students, Ai pushed the government to take accountability for the deaths with an installation listing the names of children that were killed. He also served as the artistic consultant Swiss architects, Jacques Herzog and Pierre de Meuron while they designed the Beijing Stadium for the 2008 Olympics. Ai was arrested in 2011 by the Chinese government and held for 81 days without any official charges filed against him. The government also retained his passport for four years until returning it last July. He moved to Berlin, which has recently become a haven for some of the more than 4.7 million people who have fled war in Syria. Here are five times Ai has used his work to comment on the refugee situation. 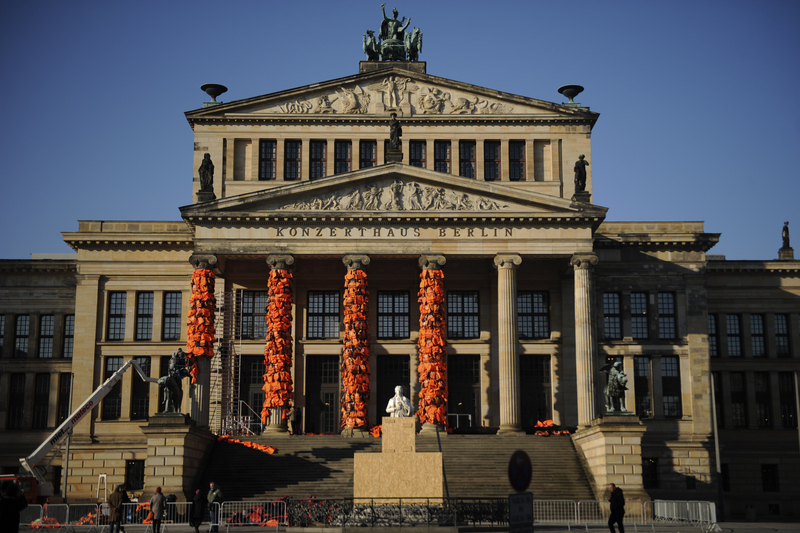 Ai wrapped the columns of Berlin’s Konzerthaus with 14,000 salvaged refugee life vests on Feb. 13. The temporary installment was created for the Cinema for Peace Gala, where Ai served as honorary president this year. At the gala event, Ai asked the room of high-profile celebrities like Charlize Theron to don thermal blankets and take selfies, according to The Guardian. People walk past the ‘Circle of Animals / Zodiac Heads’ sculptures by Chinese artist Ai Weiwei in front of the Trade Fair Palace run by the National Gallery on Feb. 5, 2016 in Prague, Czech Republic. 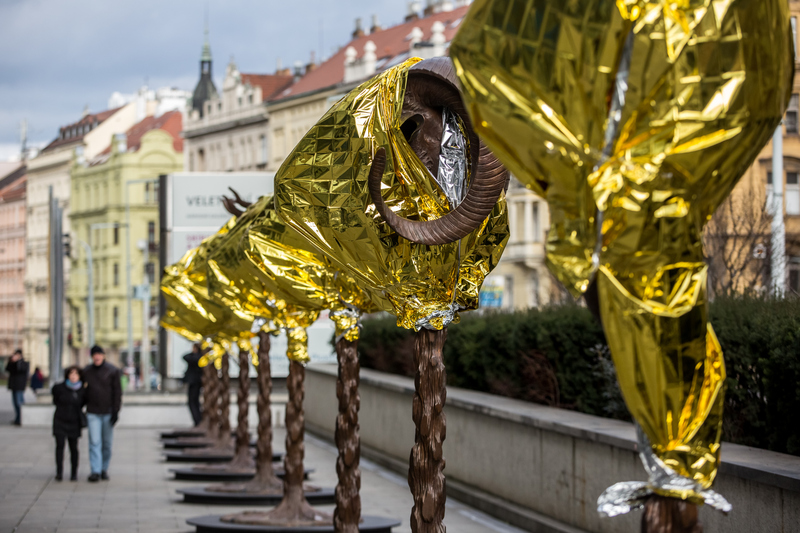 Earlier this month in Prague, Weiwei wrapped golden thermal blankets around the his Zodiac animal heads sculptures on display in front of the National Gallery’s Trade and Fair Palace. The Zodiac heads, which represent the 12 signs of the Chinese zodiac, are part of a multi-year touring exhibition that launched in New York City in May 2011. For the exhibition, Ai explored the design of fake and copied Zodiac heads, whose design dates back to the 18th century. The exhibition arrived in Prague in February and will be there through August. Ai described his display as a “gesture in defending the dignity of refugees.” The exhibition will run through Aug. 31. In protest of the new law that enables authorities to seize assets of asylum seekers as they enter Denmark, Ai closed down his exhibition, “Ruptures,” at the Faurschou Foundation in Copenhagen in January. Jen Faurschou, who owns the Faurschou Foundation, supported Ai’s decision. 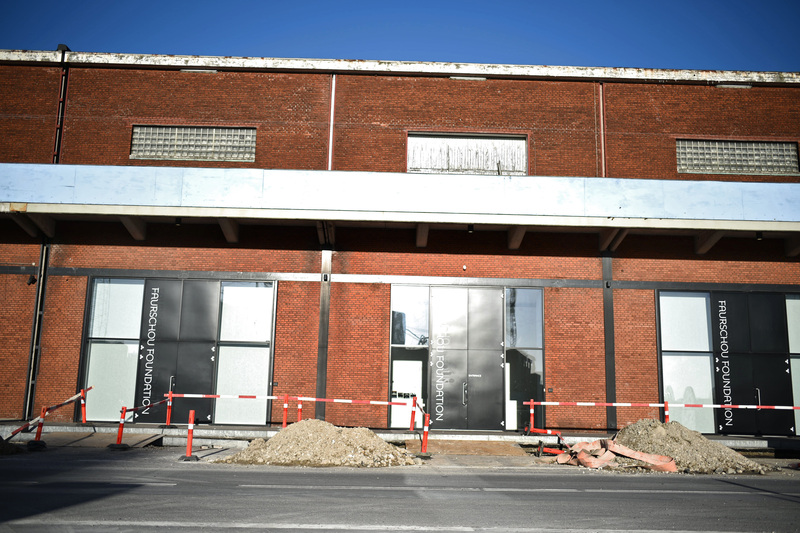 The exhibition in Copenhagen was expected to close in mid-April. “This is not so much about which country does more or less for refugees, it is the symbolic importance of the new law,” Faurschou told the Guardian. “This [kind of thing] is spreading over Europe, and we in Denmark are taking the lead in this by making this law. 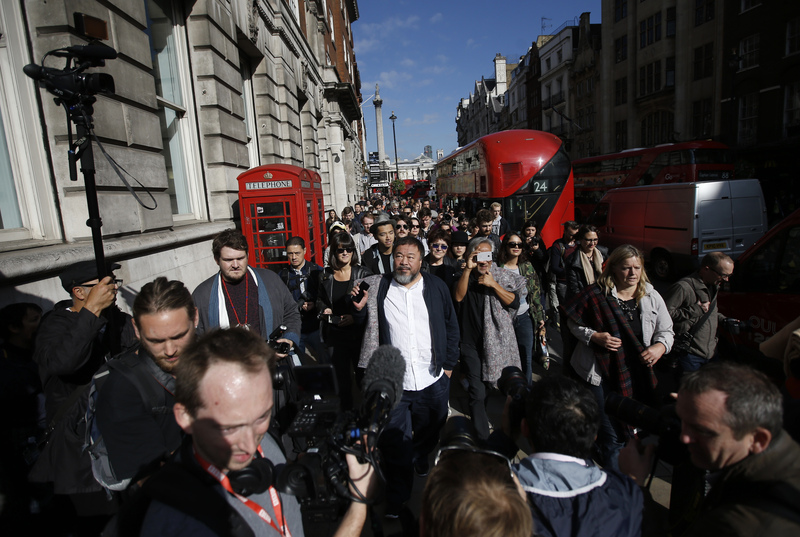 Ai organized a march in London that took place on Sept. 17, 2015, with Anish Kapoor, a British-Indian sculptor. The two walked eight miles hand-in-hand from the Royal Academy of Arts to the Orbit, an event they called a “walk of compassion,” with more than 100 followers. Ai collaborated with photographer Rohit Chawla from India Today to recreate the now-famous image of Aylan Kurdi, a Syrian toddler who drowned off the coast of Turkey. Nilüfer Demir’s photo of Kurdi quickly swept across the Internet, drawing new attention to the refugee crisis. Ai also established a studio on the Greek island of Lesbos, a key point of entry into Europe for thousands of refugees.